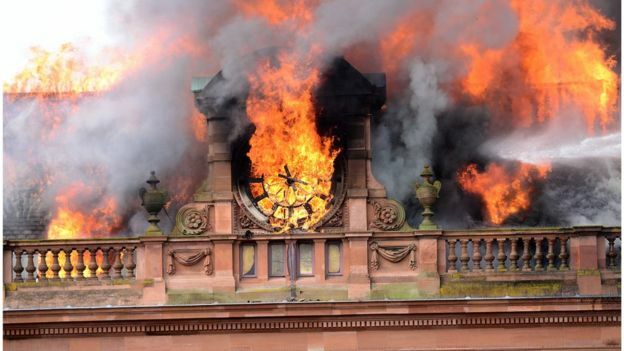 A blaze at Belfast's flagship Primark store is not the first incident of its kind at the Royal Avenue premises. From public executions to fires, the Grade B1 listed five-storey Bank Buildings has a long and gruesome history. The original building on the site was erected by Waddell Cunningham in 1785. The bank opened in 1787 as the Bank of the Four Johns, named after the four founders who shared a Christian name. After the bank collapsed it was used as the residence of the Bishop of Down and Connor, the Rev Dr William Dickson. In 1805 the building was converted into a shop. The last public execution was carried out on the building's doorstep in 1816. In 1853, a wholesale drapery firm was founded at the site, which became a commercial department store. At the turn of the century the new Bank Buildings was designed by WH Lynn, who was also responsible for the city's Central Library and Carlisle Memorial Methodist Church. Until 1961 only the ground and first floors were used as a retail store, with the remainder of the building taken up by the company's wholesale warehouse. In 1969 the original drapery firm Robertson, Ledlie, Ferguson and Co, was sold to the House of Fraser group. Robertson, Ledlie, and Ferguson continued to run the shop as a subsidiary company but four years later Boots acquired the Bank Buildings when it took over House of Fraser. Three bombs exploded in the Bank Buildings in 1975. A huge fire broke out shortly afterwards and damaged parts of it. In 1979 the Bank Buildings were taken over by Dublin-based group Primark. Within 18 months the store had been totally refurbished and the exterior restored to its 1903 glory.